Sometime ago we made an afternoon visit to the Settlement Museum within the Kampong Koh Memorial Garden. Opened in September 2003 and sited in the 70 year-old house of the Methodist Pastor, the museum traces the Foochow settlers’ history from leaving their original homeland in China in 1903 until the present day. This history covers, not only the Sitiawan settlers, but also their earlier counterparts who, as part of a previous scheme were brought to settle in East Malaysia. The wonderful thing about this museum, when compared to those under the National or State Governments, is that this tribute to the past has been put together entirely by volunteers and private funds. This is a positive demonstration of what can be done by a small dedicated group of people who share a common purpose. They should be congratulated on their achievement, particularly as the Church group that organised it only has about 300 parishioners and already runs the church, a senior citizen’s centre and a multi purpose hall, all within a nicely maintained and historic garden, which contains the original antique wells that once were the only water supply for the residents of the entire area. If only more small groups could be similarly motivated! Within the museum there is a photographic history on the ground floor, together with showcases protecting a number of smaller and interesting artifacts. Upstairs there are examples of settlers clothing, furniture, early electrical items, cameras, musical instruments, home and office equipment and more historic photographs. Downstairs again and in the maid’s areas, there are old bicycles, domestic equipment, farming and forestry tools, bottles, jars and more. Indeed the exhibits clearly demonstrate the Sitiawan settler’s life across the years and the range is as wide as it can be. This is a museum for ordinary people about ordinary people and well worth a visit. But visiting has to be planned and booked with the organisers, for a young volunteer organisation like this cannot be expected to be open all the time in the way that a government museum is. So if this article takes your fancy and you would like to see the Settlement Museum at first hand then please call 05 6920612 and give at least two weeks notice. They will be pleased to welcome you. 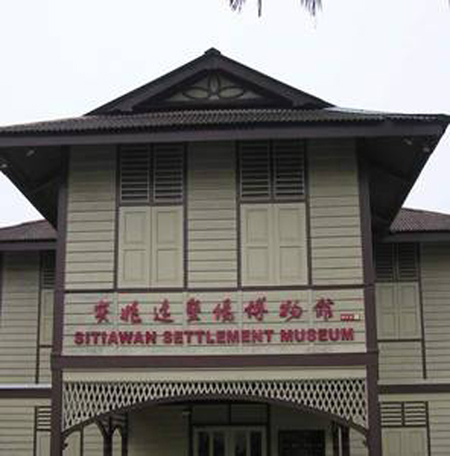 Hi Miaw Fong, thank you for your enquiry but we from Ipoh World are not in charge of the Sitiawan Settlement Museum, kindly contact the number in the blog post.